DNA confirms the identities of six bodies found in Oklahoma’s Foss Lake last year, solving decades-old missing persons cases. 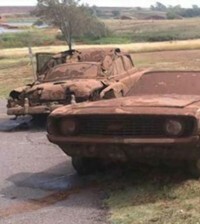 In 2013, while testing sonar equipment in Oklahoma’s murky Foss Lake, Police discovered two cars rusting side by side at the bottom of the lake. When the cars were brought to the surface, three sets of human remains were found in each car. 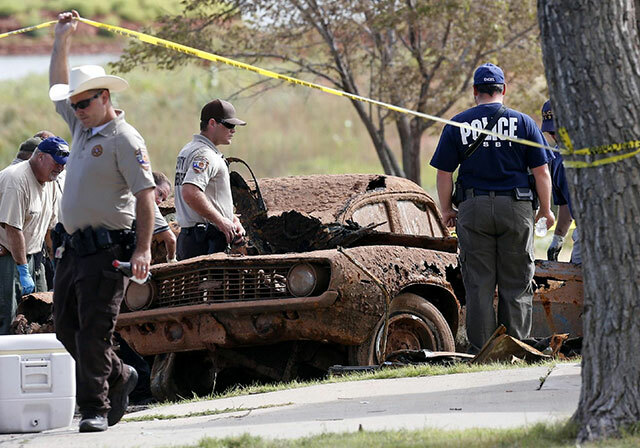 The cars, a blue 1969 Camaro and a 1952 Chevrolet, were immediately believed to be part of two 40-year-old missing persons cases. According to officials, DNA has confirmed the identity of bodies found in Foss Lake to be those of six persons who went missing in 1969 and 1970. Teenagers Jimmy Allen Williams, Leah Gail Johnson and Thomas Michael Rios were last seen heading for a football game in the Camaro Williams had just bought six days earlier. The other car contained the remains of an older group. John Alva Porter, Cleburn Hammack and Nora Marie Duncan were last seen near Foss Lake when they were “given a push” to help get their car started in 1969. Examinations of the cars indicated the engines had been running when they entered the water. Autopsies of the remains revealed the cause of death for all six passengers to be drowning. The deaths have been ruled accidental.